The loss of an employee puts a dent in your business in more ways than you might realize. When an employee leaves your company, the initial loss is obvious – one less person to get the job done. According to a study by the Society for Human Resource Management, replacing an employee could cost you up to five times the annual salary of the now vacant position. But the costs aren’t limited to dollars and cents. What about the losses that are not so obvious? Below are five lesser-known costs of employee turnover and the severe effects they can have on your business. Most businesses are run on tribal knowledge, and when members of the tribe leave, they take that knowledge with them. The knowledge that they have regarding your products, processes, strategy and customer needs is invaluable to the success of your business. Its loss leaves a gap that can take at least 4-6 months to fill and in some cases, years, depending on the complexity of the position. It’s difficult to measure the cost of this lost opportunity. Your invested time, energy and money is suddenly gone. Who do you rely on to recruit the new people? Your senior management? Who has to train new employees? Your top performers. They’re the ones with the best business practices, most knowledge and therefore the most logical choice to train the newbie. You take your most productive resources – your most seasoned managers and staff – out of circulation. Think about the trickle-down effect this can have. Mary, your number one customer service representative, has built a solid relationship with your top customers. She is the best of the best and the obvious choice to train Chris, the new guy. In order to do so, she has to defer some of her clients to Rachel, your second in line. Rachel is already operating at full capacity and does her best to fill the gap, but she is overwhelmed. Productivity, customer satisfaction and employee morale all suffer. When your top performers are being sidetracked, the costs are enormous. The bottom line is that it takes a substantial amount of time and money to bring someone up to full productivity. Someone in your company has lost a close coworker and becomes sad, bitter or distracted as a result. The people who have to take on the work of the former employee are out of their comfort zones. They’re either overworked and/or challenged to learn new tasks. Their morale drops and so does their productivity. Employees start to doubt their jobs. Maybe the grass is greener on the other side. Normally, when people leave one job for another, they experience a marked increase in pay. Some of your top performers who otherwise weren’t looking to leave might start checking out career sites – on your dime. And replacing someone with an outside hire usually costs 15-20% more than an internal promotion. The people at the top of your organization have to shift gears from focusing on strategic initiatives to replacing exiting employees. Their high-dollar salaries are now being spent on recruiting. Their primary responsibilities are put on hold. Sometimes when one person leaves for a new opportunity, others follow suit. Consider this scenario – Molly in accounting lands a job working for a local school district. She now has summers and holidays off, in addition to paid vacation. Mark and Tonya, your top two accountants, are intrigued. Before you know it, your entire accounting department has walked out the door. Your people are your greatest revenue generators. When someone leaves, either by choice or by way of termination, they leave behind a trail of costs that can be astronomical. Investing your time and money to attract and retain the right people for your business is the best business decision you can make. 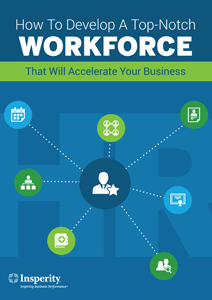 Find out where to start by downloading our free e-book, How to Develop a Top-notch Workforce That Will Accelerate Your Business, now. Thank you, Dr. Sloan! That’s great to know – we really appreciate your feedback. Please feel free to email us at blog@insperity.com regarding your thoughts on opening a discussion.